Grosset & Dunlap, 9780448466927, 160pp. As seen on the Today Show and CBS Evening News, New York Times Best Selling Kid Author Jake Marcionette explodes into the middle grade diary style genre with a new kind of story. Meet sixth-grader Jake Mathews, whose life is turned upside down when his family moves from Florida to Maryland, where Jake must adapt to a new school. Jake has always ranked the kids at school in his hand-made, humorous “Kid Cards,” and when he arrives at his new school, Jake starts building a new collection, befriending as many people as he can while staying under the radar from the school bully. But what happens when the school bully decides Jake's next in line for annihilation and his Kid Cards get into the wrong hands?!! 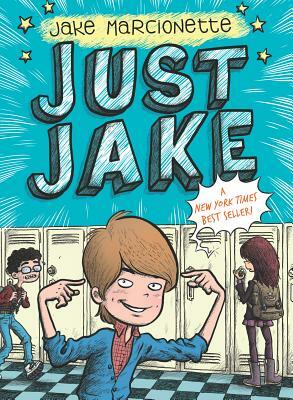 JUST JAKE is a genuine—and as Jake himself would say, AWESOME!—world of school, family, friends, and teachers; it’s the product of a writer talented well beyond his years. Jake Marcionette is in sixth grade, and lives in Maryland with his parents and sister. His favorite sport is lacrosse. JUST JAKE is his first book.